This is a great class for some quick gifts just in time for any holiday! Every hostess loves a new tea towel! 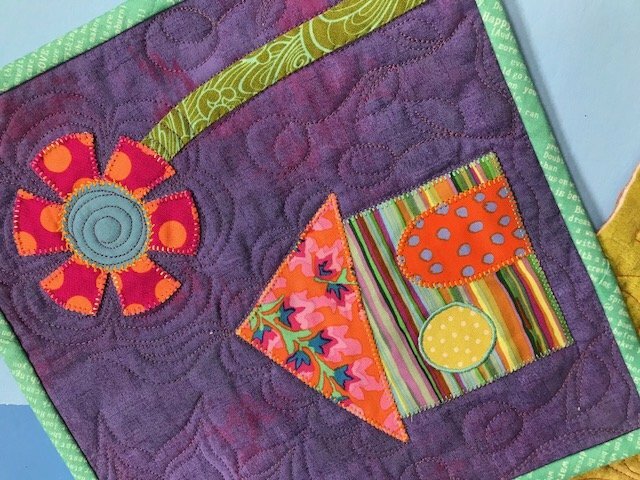 Susan will teach you all her tricks & tips for making your machine applique look professional. Machine applique is adorable on little baby bibs, little onesies and of course any quilt you have in mind and afraid to tackle. We will be using a number of applique stitches for this class, even a “faux” hand applique technique she does on the machine. It looks just like hand applique!!! If you are interested in making Susan’s “Tweet Tweet” quilt in class just let her know. This class will be all machine appliqué techniques, no hand appliqué. “Tweet Tweet” Pattern (optional) $10. You will need 10” squares of assorted batiks for this quilt. Susan used pinks, reds and oranges.